!Well Within's Earth Mysteries & Sacred Site Tours to England & Cornwall (includes Stonehenge & Glastonbury)! Day 1 Arrive in Birmingham England airport & travel to Tintagel. Day 2 Magnificent Tintagel - the legendary birthplace of King Arthur. 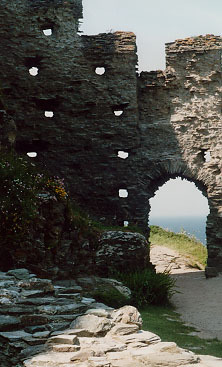 We will visit 13th century ruins of Tintagel castle standing 300 feet above the sea on a rocky cliff on a wild stretch of the Atlantic Coast. What a magnificent setting! Time also for shopping in this village. On to St. Ives area this evening. Day 3 St. Ives area - a lovely seaside fishing village, famous for its sandy beaches and art colony. It is a village of narrow streets & quaint cottages with wonderful potters, weavers, artists & other craftspeople. Day 4 -7 Sightseeing around Cornwall. During the next 3.5 days we will visit a variety of incredible ancient sites (see links from the main page) - Merry Maidens Stone Circle, Men-An-Tol, Lanyon Quoit, Holy Well at Sancreed, Madron Well, Boscawen-Un Stone Circle and more. We will walk beautiful beaches and cliffs and visit St. Michael's Mount - a mysterious mount that rises 250 feet from the sea - topped by a partially medieval, partially 17th-century castle - reached by a causeway at low tide. As we travel I will teach about the history of the area as well as the information about all of the ancient sites. Healing rituals at the sacred wells if desired. Travel from Cornwall back towards London for overnight before flying home. Travel back towards London for overnight on Day 7.